The long-adored Sylvanian Families toys have been putting smiles on the faces of children – and adults too – since the mid ’80s. But how could they not? The little fuzzy, flocked plastic creatures are adorable and reek of nostalgia, with an array of retro countryside settings, including manors, cabins, windmills and other fairly middle class locations, to house more than 60 different animal families. This shop in Highbury stocks the lot, plus a few discontinued and rare items to boot. Opened in 1993 the Sylvanian Families Shop has been delighting Sylvanian Families collectors from all over the world for two generations, and stocks a huge extended range of Sylvanians with more than 400 different products! A really English shop. I love the window display. Everyone needs Slvanians in there life! Unique and magical, with an amazing range of products and extremely knowledgeable staff. Really friendly staff, lovely displays and a great insta feed too! It is a fun place for young children & collectors alike to step inside a world that they love. In the 14 years I've been a collector the staff have been so amazingly helpful & welcoming! I love the detail in the homes and characters! A lovely place for kids (and grown ups) who love Sylvanians. If you love Sylvanians this is the place to shop, as it must have the best range in the country. It also categorises so you can see if something is being dropped from the range. There displays are lovely. This is one of our 'Must dos' when visiting London. This is the best place for every Sylvanian Families lover! My granddaughter loves Sylanvian Families. I took her to the shop and was completely mesmerised by everything. Brilliant friendly customer service. Lovely place to shop for high quality affordable toys. Beautiful shop with helpful and knowledgeable staff. Items you won't find anywhere else! Brilliant shop, lovely atmosphere. Everyone has a smile on their face and you will ultimately come out with a smile on your face. It may be small but it holds a load of Sylvanians and I absolutely love the shop and would spend everyday there if I could. Very good shop. Very nice displays. Friendly and helpful staff. Would like to visit again. The only place to buy your Sylvanian Families from - fantastic personalised customer service - best range of Sylvanians - current and vintage ranges - quite simply Sylvanian Heaven!! This shop is a must visit Venue for all who love Sylvanians what ever their age. The welcome and knowledge you get here is amazing, the service second to none if you are a collector or not, you will love a visit to this shop, dont miss it !! This cosy and welcoming shop is a treasure trove of all things Sylvanian Families. The shopkeeper took a great interest in the fact we had made a special birthday trip from Bristol to visit the shop. The experience more than exceeded our expectations. This is one of the most unique toy shops in London, with the most extensive selection of Sylvanian Families we've ever seen. You're guaranteed to lose hours in this shop - the displays alone are fantastic. 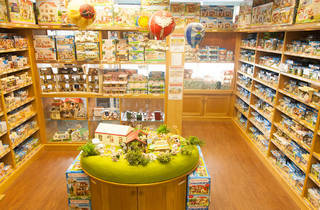 Paradise for all Sylvanian Families lovers! Let's play, imagine, relax, enjoy. Remember when you used to play for hours. Smile. And, please close your mouth, but let the stars shine in your eyes. Fantastic shop - made special visit to London to visit the shop for a birthday treat, very special and would love to go again. This cozy little shop filled with Sylvanian Families and very friendly staff made me feel at home. I am a collector of Sylvanian Families for 30 years and this is the best shop I've ever seen! A real north London gem - a true one of a kind. Great service, fantastic range, so special!